The Axis Long Term Equity Fund is an open-ended, actively managed Equity Mutual Fund that predominantly invests in large-cap company stocks. The fund seeks to provide its investors with long-term capital appreciation through systematic investments. As this is an actively managed fund it can dynamically change its investment composition to suit prevailing market conditions and take advantage of opportunities arising in the market. The Axis Long Term Equity Fund is an Equity-Linked Saving Scheme (ELSS) under Section 80C of the Income Tax Act, 1961 and carries tax-efficiencies for its investors. The Axis Long Term Equity Fund is an Equity Mutual Fund that invests primarily in large-cap company stocks, as a result of its exposure to equity the fund is also exposed to market volatility. The volatility of this fund is low when compared to small-cap or mid-cap funds, but is still present. The Axis Long Term Equity Fund is suitable for investors who have a moderately high risk appetite. As this is an ELSS it carries a mandatory lock-in period of 3 years, this works as an advantage for the investor, as this fund can reward the investor handsomely in investment cycles of 3 years or more. The Axis Long Term Equity Fund is an actively managed Equity Mutual Fund that carries a large-cap bias. As this is an Equity Mutual Fund, according to its mandate this fund will invest a minimum of 80% of its assets in equity and equity related instruments, the fund can invest up to 20% in debt and other money market instruments. The asset allocation of this fund according to its mandate has been provided below. The Axis Long Term Equity Fund is a diversified mutual fund that invests across sectors, primarily focusing on large-cap companies. The fund distributes its equity investments across 32 stocks of companies from various sectors. The top 10 stocks of the company make up 63% of its equity investments. The fund seeks to invest in companies that demonstrate sustainable business practices, efficient capital allocation, and other operational efficiencies. As this is an actively managed mutual fund its can change its investment composition to suit prevailing market conditions and take advantage of opportunities arising in the market. 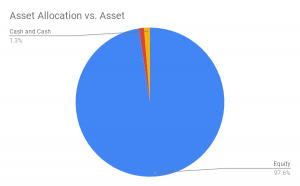 The sectoral allocation of the fund has been provided in the chart below. The Axis Long Term Equity Fund was launched in December 2009 and has almost consistently outperformed its benchmark and category since its inception. The fund saw its best performance between September 2013 and September 2014. 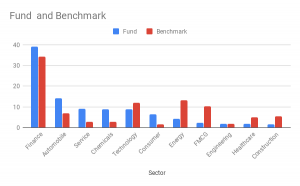 The fund carries an Alpha of 0.44 which is higher than the category average of -0.12, the fund also carries a Beta of 0.93 which is marginally lower than the category average of 0.96. The Alpha and Beta of the fund demonstrate the fund’s ability to produce higher-than-expected returns while providing good stability. The fund produces good returns in bullish markets and mitigates losses well during bearish market cycles. The fund performs best in investment cycles of 5 years. 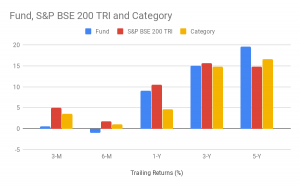 The trailing returns of the fund against its category and benchmark have been provided in the chart below. The Axis Long Term Equity Fund seeks to provide its investors with long-term capital appreciation and income through systematic investments in equity and equity related instruments and debt and other money market instruments. The fund does not guarantee that it will achieve all its objectives but will continually strive to achieve them. The Axis Long Term Equity fund employs a growth style of investment, focusing more on the future potential of stock to perform rather than its current market value. The fund uses a combination of bottom-top and top-bottom analysis to select stocks. The Axis Long Term Equity fund actively seeks stocks of companies that demonstrate sustainable business practices and other managerial efficiencies.